This sky map shows where to look to see the moon and Jupiter together in the night sky on Jan. 2, 2012 at 6 p.m. local time from mid-northern latitudes..
Skywatchers who gaze high toward the south as darkness falls on Monday evening will notice an eye catching pairing-off between two of the brightest objects in the nighttime sky. The moon, appearing as a waxing gibbous phase, two-thirds illuminated, will appear to stand well above a very bright, non-twinkling, silvery "star." But it won't be a star that will be keeping the moon company on the second night of the New Year, but the largest planet in the solar system: Jupiter. 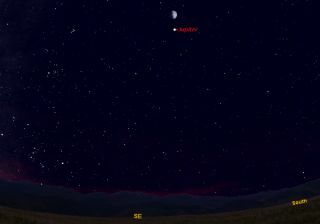 The sky map of Jupiter and moon here shows where they will appear in the sky tonight, weather permitting. Jupiter is currently boldly shining fully three times brighter than Sirius, the brightest star in the sky (which comes up above the southeast horizon around 6:45 p.m.). It appears about 3 1/2 times dimmer than the dazzling planet Venus which itself appears to mimic a brilliant lamp well up in the southwest at nightfall. Jupiter lies far to the east of Venus, inching toward a beautiful conjunction that the two will have in mid-March. Currently, Jupiter is setting around 1:45 a.m. local time, but by month's end it will be setting around midnight. By the end of January, Jupiter will be 42 light-minutes away and appears about 21 percent smaller than it did when it loomed closer to us in late October. Whether seen with a telescope or binoculars, however, the giant planet remains large and bright enough to be endlessly fascinating. One final point concerning the moon passing by Jupiter on tonight involves an observational challenge. During the late afternoon hours, when the sun is still above the horizon, can you find Jupiter in the daytime? Certainly, you should have no problem in finding the moon, which will be readily visible in the south-southeast part of the sky. Jupiter will be situated about 5 degrees below it. Your clenched fist held at arm's length measures 10-degrees, so Jupiter will be about a "half fist" below the moon. If you can’t see Jupiter with your unaided eyes, try scanning that area below the moon with binoculars and you should quickly pick Jupiter up; a bright "dot" of light against the blue daytime sky. After locating it with binoculars, try once again with your unaided eyes. The closer you get to sunset, the more likely you’ll catch sight of this big world. Editor's note: If you snap an amazing photo of the Jupiter and the moon, or any other skywatching sight, and would like to share it with SPACE.com, contact managing editor Tariq Malik at tmalik@space.com.